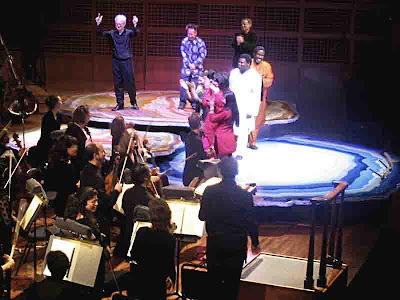 Two weeks ago I traveled to San Francisco to hear 2 performances of A Flowering Tree, the newest opera by John Adams. I feel some pressure to write a few words about the piece soon, before John premiers his next opera. Here's a picture of the composer, director, choral conductor and entire cast of singers and dancers (3 each) acknowledging the excellent performance by the San Francisco Symphony. I liked the way one dancer and one singer combined to portray a single character and also the simple but dramatic lighting effects. This is called "reduced staging"; it was very effective. The orchestra music of A Flowering Tree is indeed quite magical. John has discovered some new avenues of orchestra sound to explore. And I marvel how well he can control musical pacing over more than two hours . As someone who struggles with music that lasts only a few minutes I wonder more and more how it's possible to construct such long pieces - and to get audiences to sit still throughout. I spoke with John after both performances and, pretty much, the above is what I told him. Here's a picture of the entertainment, largely ignored, at the post-concert party. I guess Indian music reflected the Indian origins of the story. 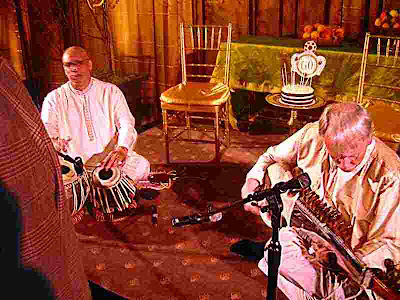 I had an interesting conversation with Mike the sarod player. To the left of the tabla player you can see a brown, vaguely plaid, mass. That is the sport coat of the composer himself. Note the birthday cake for him between the two chairs. 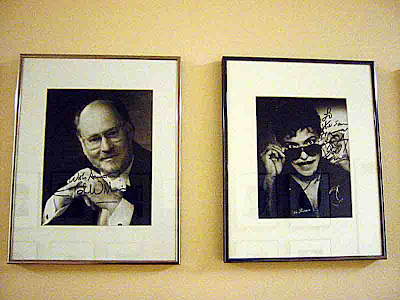 The main backstage hallway at Davies Symphony Hall is adorned with row upon row of autographed headshots of famous celebrities who have performed with the San Francisco Symphony. I couldn't resist snapping evidence of a reunion between Star War's John Williams with Tutti Frutti's Little Richard. If you're wondering why I took the time to make this trip - since I'm neither a fan of opera or even of live performance - it's because I've been copying music for John Adams since 1985. Getting out of my little cave and hearing a whole completed work of music helps me keep some perspective on the purpose of my own small involvement. Meanwhile I spent my time wandering around in San Francisco's Civic Center - snapping pictures and marveling at being in a real city. 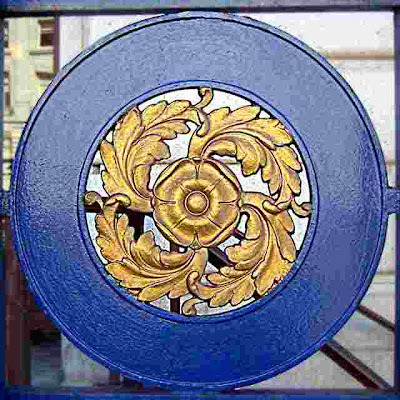 This is part of a metal fence outside War Memorial Opera House, kind of an Art Deco Mandala or maybe a shield for a supernumerary spear chucker. Most of the architecture in that part of San Francisco is large blocks of stony permanence adorned with guilty gilt trips and ostentation - the sort of thing intended to remind people that they are doing important work. 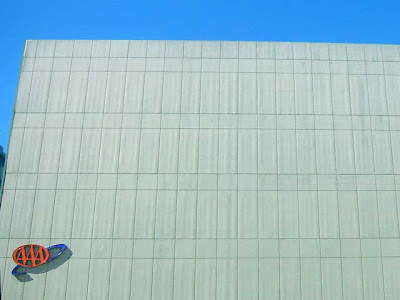 But my eye was more fascinated by the nearby headquarters of the AAA where architectural conformity must be a serious human burden. This 50's-ugly office building has a color somewhere between oxidized copper and travel-sickness vomit. In the finest Mixed Meters tradition, here is a picture of a blank wall desecrated only by the AAA corporate logo mandala in starkly contrasting red and blue. Several weeks before this trip I had doodled a melody - just 7 notes - on Bill Kraft's piano. He asked "What's that?" and I replied "I don't know, I just made it up." For some reason I didn't forget it and used it as the seed for this 30 Second Spot, constructed mostly in a San Francisco Starbucks. 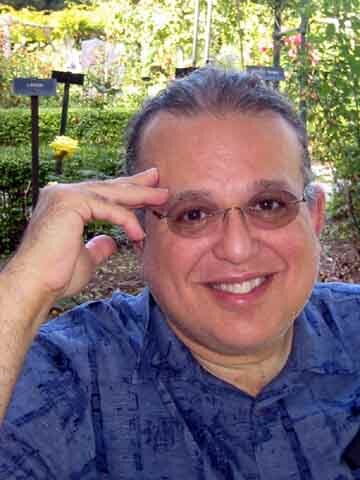 click here to hear Bill Kraft's San Francisco Waltz Toon It's vaguely waltz-like, not cartoonish at all and even, uncharacteristically, somewhat somber. Or maybe the right word is "empty." I doubt Bill will ever dance to it. Here's a biography of William Kraft - I've been working for him even longer than I have for John Adams. Other Mixed Meters Blank Wall posts: click on the blanks blank wall or blank wall or blank wall or blank wall or blank wall. If Music Be The Food Of Love . . . .